At first the tool looks pretty simple, but it’s about to get a bit more complicated. Use your keyboard arrows to select your first hard drive and press enter. The installer asks you if you want to create a new empty partition table. Select yes. You return to the main partitioning screen, but now there is a new entry under the first drive: free space. Select that entry and press enter. Here we are going to create our first partition. 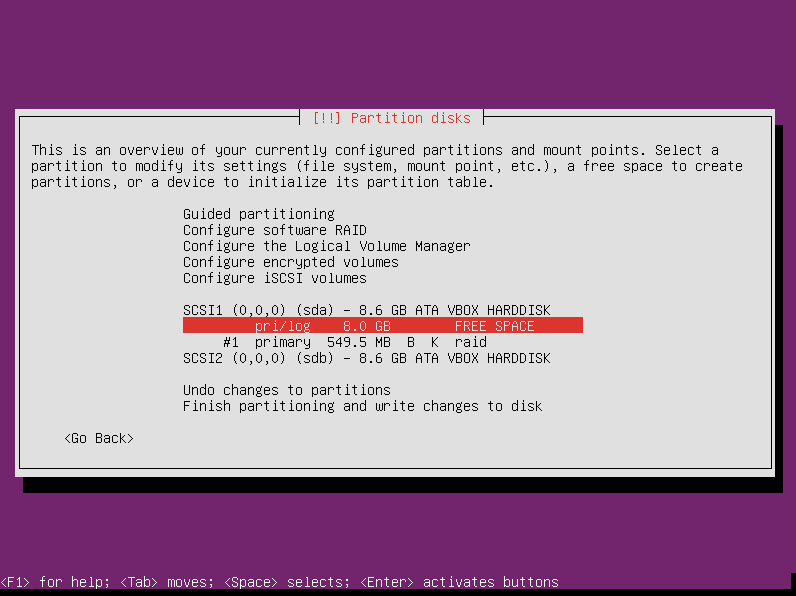 Select “Create a new partition” and press enter. The installer will assume you want to create one partition that is the size of the entire disk. That is NOT what we want to do. Change the partition size to 550 MB. This is going to be the partition we use for the boot directory, so it doesn’t need to be any bigger than that. Yes, we want it to be a Primary partition, so press enter. Since the partition isn’t taking up the whole disk, the disk partitioner needs to know where to put it. Some might tell you that the boot partition has to be at the front of the disk, but this isn’t true. I prefer to put mine at the end so that I can put my swap space at the beginning of the disk (because the beginning of the disk is faster than the end). You can put it wherever you want to because GRUB2 can find it in either location. Make your selection and press enter. After creating the partition, you are immediately taken to the screen to edit it. It defaults to being used as an ext4 filesystem. If you were just using one disk, that would be fine, but we are trying to set up a RAID1, so that’s not what we want. Select the “use as” entry and press enter. We want to use this area as “physical volume for RAID,” so select that and press enter. 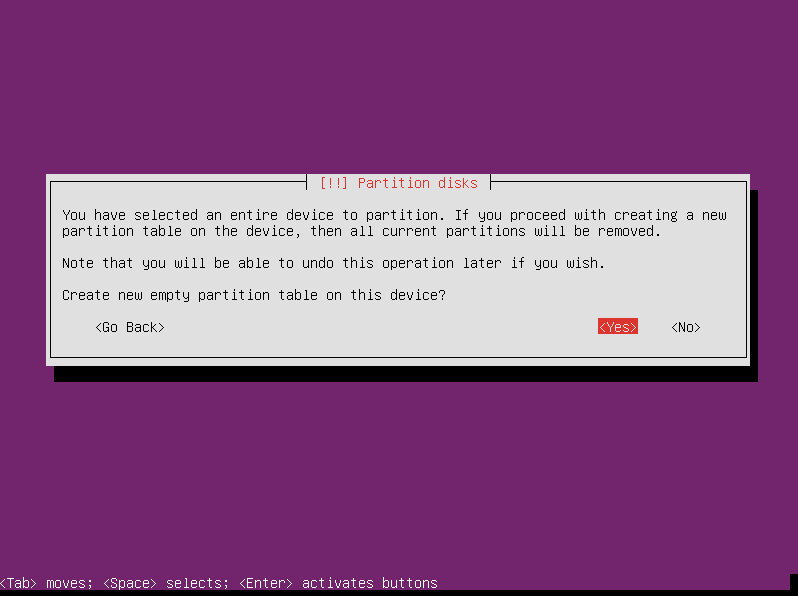 That’s all we need to do with this partition at the moment, so select “done” to return to the main partitioning screen. 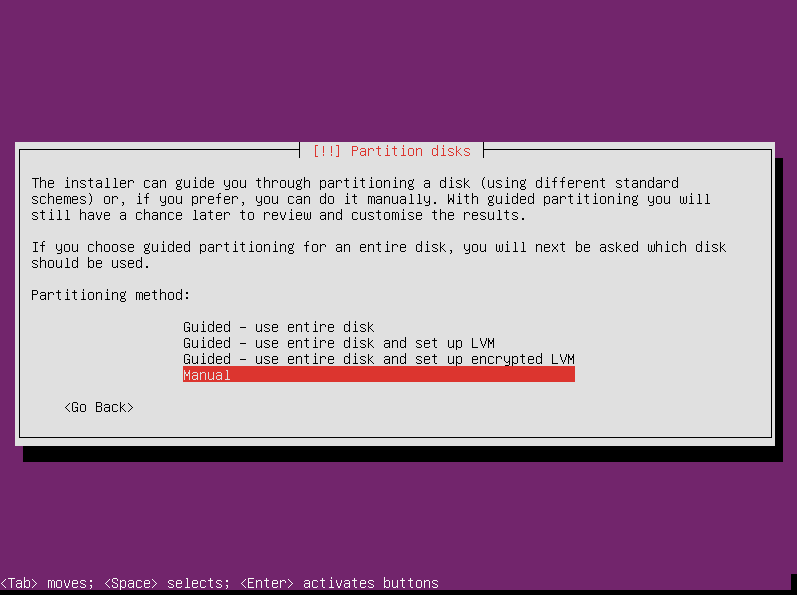 This screen now shows two entries under the first disk: one is the partition you just created, and the other is all the remaining free space. That’s where we are going to create our next partition, so select that and press enter. Again, we are going to create a new partition. The partitioner needs to know how big to make this second partition. This tutorial is only covering a two-partition setup, so we are going to keep the default size, which is all of the remaining free space. If you are creating other partitions (e.g. 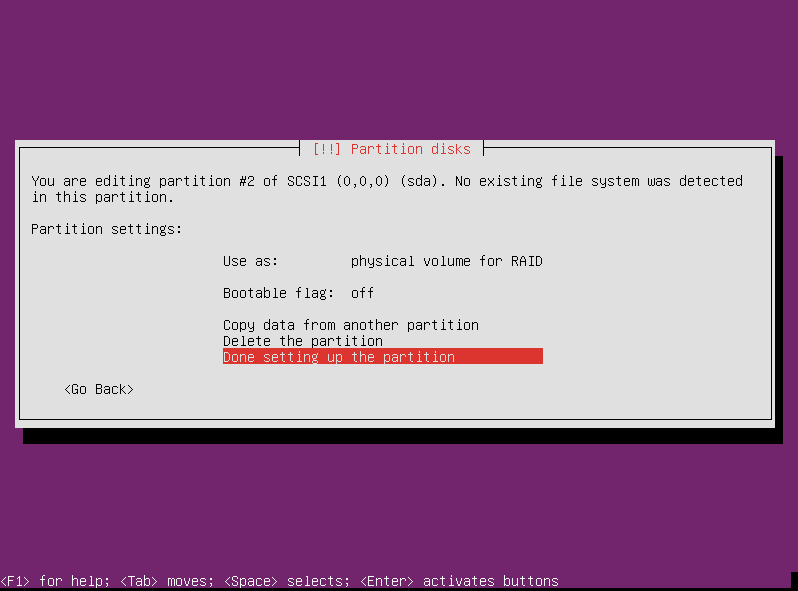 a separate /home partition), then obviously you will need to do that before you fill up the whole disk. The partitioner will default to make the second partition logical, but we want it to also be a primary partition. Select that and press enter. 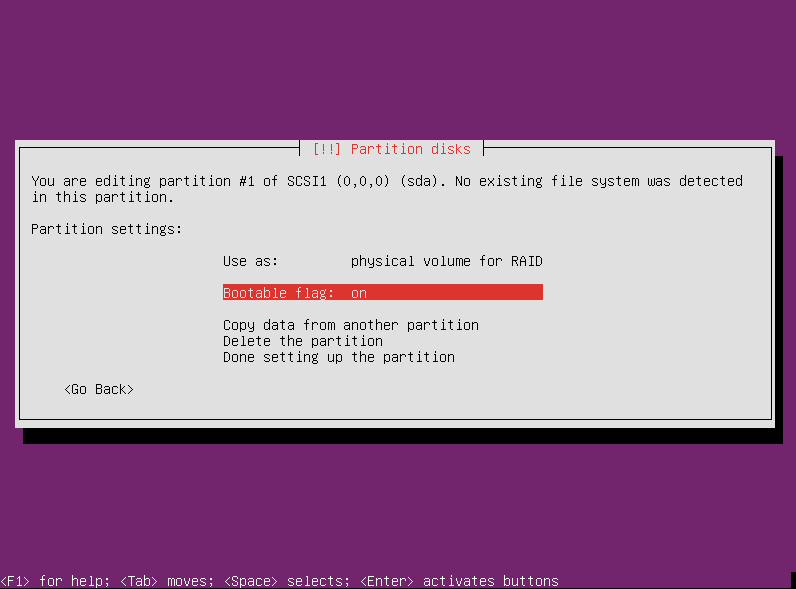 Again the partitioner defaults to using the partition as ext4, but this will also be used in a RAID so select the “use as” entry and press enter. We want to use this partition also as a physical volume for RAID. In this case, we are leaving the bootable flag off, so we are done editing the partition. Select done and press enter. Now that we’re back to the main partitioning screen, it’s time to do the same thing to the second hard drive. Since it is literally step-by-step the same exact process as we just did for the first drive, I won’t repeat how to partition the second drive. Just do the same thing. At the end you should end up with a screen like this showing two identically partitioned drives.